You don't have to be a chessplayer to appreciate the psychological insights and life lessons in Dr. Frank Brady's recent book on former American world chess champion, Bobby Fischer. 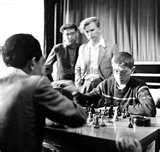 A lot of people experienced a life similar to that of Bobby Fischer. He could be one of those who may had been saved by psychological and spiritual healing. Dr. Magnus Skulason, a psychiatrist from Reykjavic, knew Fischer well when he was hospitalized near the end of his life. He kept him company, as Fischer did not want to be alone. Dr. Skulason reported Fischer's last words as "Nothing is as healing as a human touch." Bobby Fischer's life is interesting. But it's a tragedy. Lots we can learn from it though.